We became official partners with Racing Point Force India Formula One Team at the beginning of the 2014 season. The joint venture was announced ahead of the team’s home race at Silverstone and the partnership continues today for a fourth season. 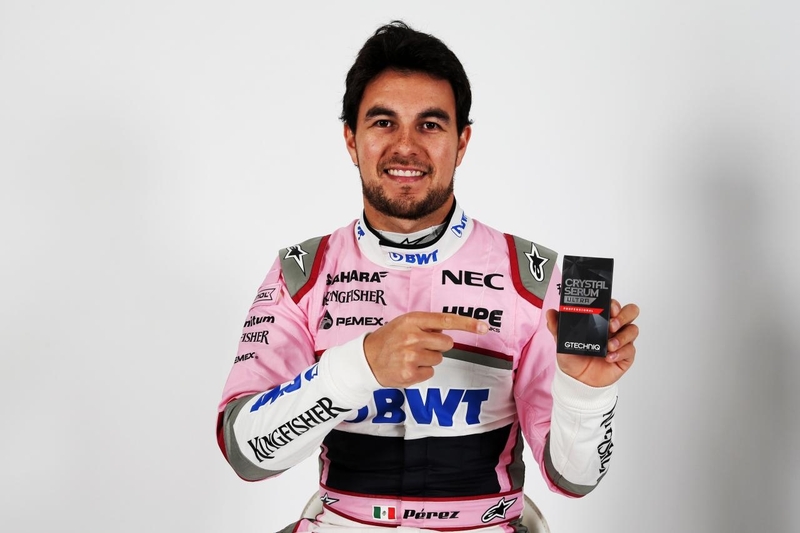 Gtechniq joined the Silverstone-based team, to help maintain the aerodynamic efficiency of the team’s two cars, now driven by Sergio Perez and Esteban Ocon. And until the end of the 2020 season Gtechniq will be the team’s official supplier for all car care products and surface protection. Over the last six years Gtechniq has worked closely with Force India to maintain the aerodynamic efficiency of the team’s two cars, supplying them with a number of advanced ceramic coatings. Crystal Serum Ultra, our 10h ceramic coating developed for Accredited Detailers, enhances the stability of the aerodynamically sensitive surfaces of the race car by minimising debris adhesion and maintaining a clean performance surface. Force India’s Technical Director, Andrew Green, said: “A Formula One Car is designed to an incredible degree of precision and it’s crucial to maintain all the aerodynamic surfaces in the correct condition so they behave as originally designed. Rubber build-up is highly disruptive and a product like Crystal Serum Ultra is vital to prevent loss of performance. We are delighted to continue our technical partnership with Gtechniq and benefit from their expertise”.